Every once in awhile, you may find yourself craving something sweet. With spring here and such nice weather afoot, you find yourself rather wanting to sit outside with a nice glass of lemonade. Well even though they say you can’t have your cake and eat it too, I can happily disagree and soon you can too when you get a hold of these sweet Pink Lemonade Cupcakes! Before you start cooking, make sure that your oven rack is positioned in the middle of your oven to assure even heat transfer. This will enable your cupcakes to spread and rise evenly throughout the cooking process. 1. Preheat your oven to the recommended temperature, which you can find on the back of the cake mix box. Depending on how fast and how hot your oven gets, you may need to adjust the preheat level. 2. To make your cupcakes, follow the directions on the back of the cake box. Any old yellow cake mix will work for this, but I am partial to using Super Moist yellow cake mix by Betty Crocker. For the Super Moist yellow cake mix, the recipe calls for ½ a cup of vegetable oil, but instead I always use canola oil as it is healthier. 3. Once your cake mix has been prepared you will now want to add your lemonade mix. Be sure that you are using a measuring cup for dry goods and not wet ones as it will have a significant effect on the taste of your cupcakes. For more of a lemon taste, try adding more powder and vice versa. Stir lemonade into mixture. 4. Feel free to use any type of cupcake cups you may have, but if you want to really add character and the feeling of spring to these treats, try going for colorful cups. My friend found me some colorful petal shaped baking cups by Wilton a while ago, so I finally put them to good use! Now it’s time to fill your cup. I use a ladle for this part as I find it makes doing this a whole lot easier. I usually fill the baking cups about halfway, but because I had fairly tall cups, I went for about three quarters of the way. Once all of your cups are filled, pop them into the oven for 20 to 25 minutes. Depending on your oven the time may vary. *Cupcake tips: When you are needing to check on the cupcakes’ progress, look through the oven door. Opening your oven too many times to check on your cupcakes will release the heat, and if your cupcakes are only slightly firm, the suction of the air can make them fall flat. While your cupcakes are cooking, you can move on and make your easy fix, pink lemonade icing. 1. Empty the container of lemon frosting into your small bowl. Just like with the cake mix, you can use any brand you like. I used the Rich and Creamy Lemon icing, too by good ‘ole Betty. 2. Pour in your packet of pink lemonade mix. This will give you not only a great pink color, but also an extra kick of lemonade. Similarly to our cake mixture, use less lemonade mixture for less taste. For an overall color make sure you stir the icing mixture well, but if you want a cool swirl effect of pink and yellow, stir only halfway. Now that the stirring is all done and hopefully the cupcakes are cooled, it’s time for icing them. 3. You can do your icing anyway you want, but if you want to make your cupcakes look really fancy, try piping your icing onto your cakes. If you don’t have a piping bag on hand, you can easily make one yourself. Simply take a plastic baggy and pour some of your icing into it, pushing it to one corner of the bag. Twist the top of the bag closed and cut a fourth of the corner where the icing is off. Be careful not to cut too big or this won’t work. 4. 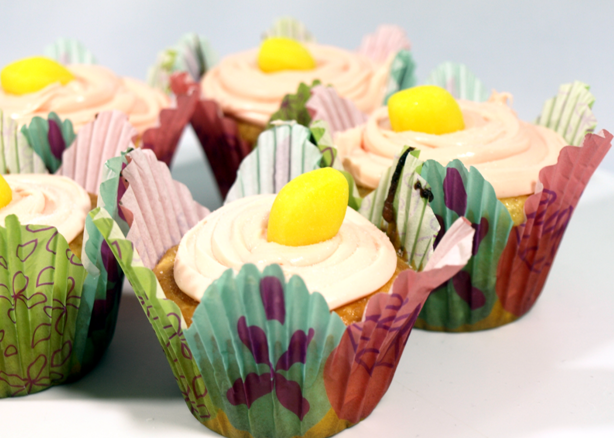 Now that our cupcakes are all pretty, it’s time to add a drop of sunshine to finish them up. For these cupcakes I used a medium sized lemon drop candy, which I placed in the middle of each cupcake for a finishing touch before sprinkling them with sugar. Get creative with the final decorations of your cupcake by using other kinds of candies, marshmallows, sprinkles and even lemon cookies.